I Have Been Falsely Accused! On Saturday, March 9th, a terrible crime was committed at our home! Sometime between 8:30 AM, when Jen left out to commence her investigation, and 11:00 AM, when she returned….. well, you can see for yourself. Jen was understandably upet. So was I. How could this have happened without my knowing? Now, wait just a minute Jen! You don’t think that I had anything to do with this…. do you? It’s just a coincidence that I developed an upset tummy Saturday night. I’m innocent, I tell ya! See? There’s a cat! THAT should be your prime suspect! It appears each of the cat food cans were licked clean, so DNA testing may take place, unless someone goes ahead and confesses. In the meantime, I am working on my defense. « Happy Mother’s Day from DeDe! Checking your breath … hmmm smells a bit fishy … do you want us to start a fund for your lawer? If you need an alibi, we have a standard form of words used to great effect on multiple occasions. It’s actually based on Pinnochio’s denial of culpability from Shrek. We have had such investigations! I’m sure your tummy was only upset because you were stressed that it happened – not because you ate all that trash!! Oh the injustice! Of course the cat did it! I believe some serious sucking up is in order … just in case your defense falls apart!! Bribes always work! Get Mommy some jewelery & she’ll forget all about it! LOL Anyhow, something must have been in the air this weekend, because I (Bella) was bad too on Saturday, but I was caught in action. Wow ! The purrfect crime, somebody put a lot of thought into this. This must have required some sophisticated prepurration Rumpy. I don’t think you should worry about the investigation, there’s no way you could have done this. Rumpy, you’ve obviously been framed. Those evil birds (who I hear have teamed up with some pesky squirrels) must’ve sneaked in while your back was turned! Never admit to anything! No cameras, no proof! Pretty sure it was the cat! How could Jen suspect a dog with a face like yours??? Innocence all over the place…..! I sure hope I get you guys on the jury! I’m coming over to your house!!!! Hey! Whose side are you on??? 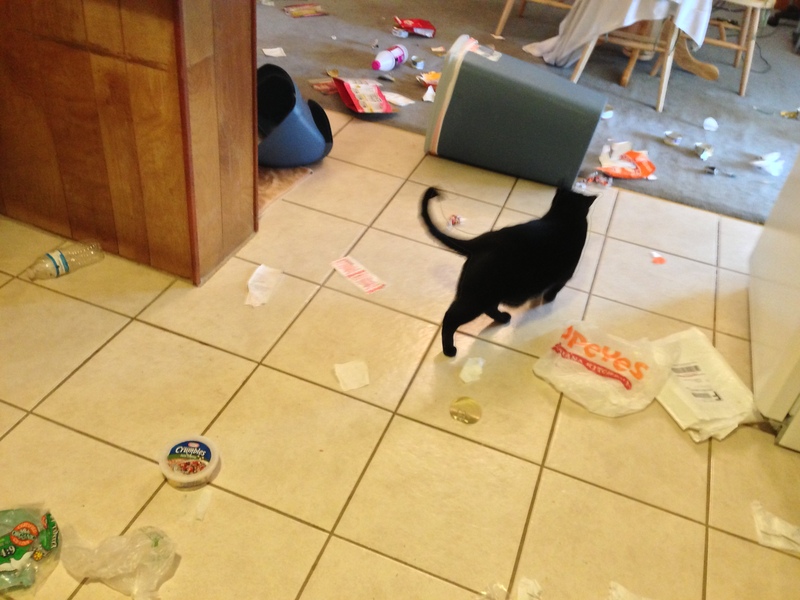 I know you live with cats, there is even one in one of your evidence photos…I would stand by the story that the cat did it! I commensurate . My ex accused me for every horrible matter that went on in the entire world and when I ran for public office in the ’80s the newspaper and opposition accused me of so many things, well I would have to be 700 years old to have done even just 1% of everything. LOL – yeah, you look totally innocent! I would tell Jen a band of gypsies broke in and did it and leave it at that! Your upset tummy was probably due to the worry of it all. I don’t know how anyone could suspect you! Oh dear it does not look good – until you can afford a top notch lawyer you can hide out at our house – I will bake cookies! When can we expect you? Some of that went on at our house too, must be something in the air! Thanks for following my blog. We have a Boxer, Silky Terrier and two domestic short hair kittys. All are rescues. Cat food cans licked clean…. oh it was a cat who done it for sure. I am not saying one of your cats. But maybe a cat who is a professorial cat bugler who has skills for breaking in. Oh no! Poor rumpy! Maybe your tummy was upset because Jen was upset? You poor sweetheart. I would never accuse you.. I think a strong wind blew through the house as Jen was leaving and what’s what really happened. Uh-oh! I don’t believe for one mintute it was Rumpy! I agree with one of the comments above- it must have been aliens or ghosts! I’ve came home to messes like this in the past. Del looks so sad when I find the mess that I know it can’t have been him that has done it! I think the upset tummy might be the giveaway. I really don’t see evidence of a crime? My house looks similar with three children. Carry on. Poor Rumpy:( Temptation lurks in garbage cans – YUM! Oh nooooo. 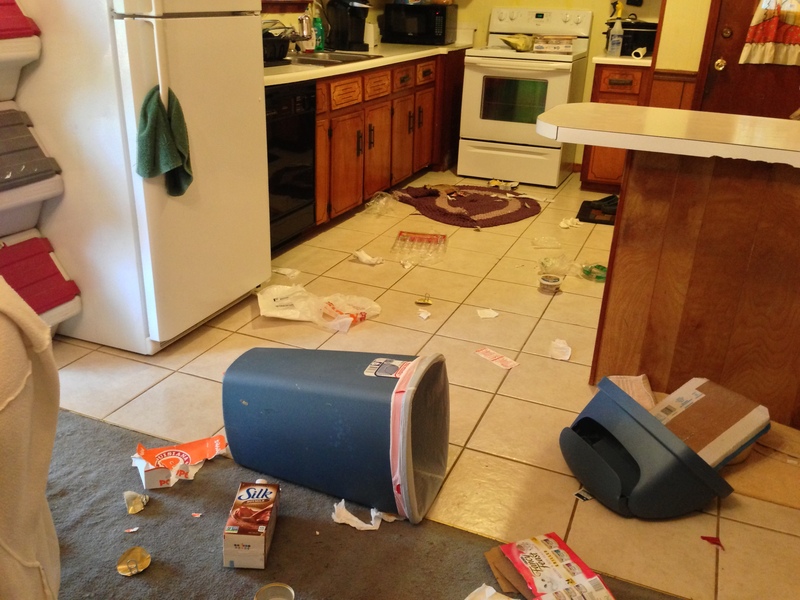 M is laughing her head off because she came home to a mess like that once – years ago when she had a schnauzer and a “smart” kitty. The kitchen floor was a disaster area. Love the expression on your faces too – such innocent looks. Greetings. It looks like S.O.D (someotherdoggy) has been to visit you. We have been wondering where he has got to. It could not have been you. Rumpy, do a thing like that? Never!! Eko and I are happy to be character witnesses for you at the trial. I’m pretty sure you’re innocent and that the upset tummy is from being falsely accused! You was railroaded. We sure. In OUR opinion that looks like the work of a bunch of SQUIRRELS. back when Dave Barry was holding court he seemed to KNOW dog and cat psychology and behavior. Cats, he said, will sit aloof when you come home, even sitting right next to the broken plant-pot, broken clay spilled dirt roots and stems akimbo, as if they had nothing to do with this. Dogs, on the other hand, all will cower and cringe and gladly(?) take blame for anything that happened … even if somehow they had nothing to do with it. Rumpy here’s some evidence you can present to prove your innocence. Of course you are innocent, but we suggest you and Dede work on perfecting your look of “not me” – you both look guilty in that last pic. One more warning-don’t admit anything to June-Buggie—she might squeal on y’all!! Good luck, Rumpy. This criminal was clearly very thorough. I bet he wiped all the surfaces clean of paw prints. This crime is hilarious. I mean heinous. DON’T be falsely accused, Rumpy. Remember, it’s all circumstancial! Rumpy, cough up your commission for letting that new event planner use your home for a furbaby recreation center. (Still wasn’t you.) Then Mom can give you some Pepto and move on to important things like taking you to Petsmart to help you spend that commission. Poor Rumpy. You have to fight for your rights. Make sure they Merandarize you. DNA is a good idea. Good luck. Gulp, does look like maybe S.O.D. 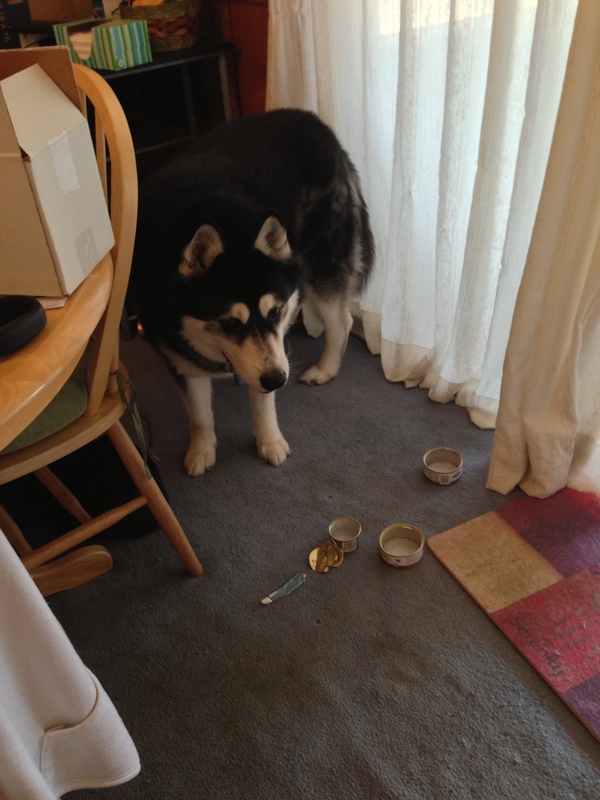 (some other dog) came over from Jasper and Nellies Blog and messed up Jens kitchen. DeDe couldn’t have been involved, look how cute she is. You will be called as a character witness! woo woo woo! This is all hearsay evidence. No jury of your peers would ever convict you on this, especially given the abundance of other possible culprits on the premises at the time of the crime. You will go free. LingLing, Oreo, and Tilly Tot are ready, able, and willing to testify on your behalf. Woo hoo! Be in the lookout for that subpoena! Circumstantial evidence, Rumpy! I’m sure it was the cat! They do stuffs like that! You even look innocent! Rumpy, I think you have civil lawsuit. I think what really happened was your head got stuck in the guillotine swing topper of the trash can and fearing for your life the trash got strewn about trying to get out of the trap. You poor thing. You could really have been hurt by all this!!!! It was the cat next door I saw him!! Had my dachshund still been alive you could have probably blamed him. He was caught “red-handed” or is that “red-pawed” several times. Rumpy, fallen in with a bad crowd? Sigh. As long as she doesn’t get those DNA tests done! I’ve seen this phenomenon before. People always blame their pets, or poltergeists if they don’t have pets. But don’t play the poltergeist card, Rumpy. There’s no such thing as poltergeists. This was the work of an indoor tornado. The science behind those is a little complicated, but basically a sudden shift in temperature causes warm air to mix suddenly with cold air and, bam! You have a funnel cloud. Usually, they are small scale, causing otherwise inexplicable things such as all the toilet paper to be unrolled on the floor, or the car keys ending up in the garbage. This was obviously on a much larger scale. Also, few people know this, but when cold air gets into a dryer, it creates an indoor tornado that’s capable of sucking up socks! Hmmmm… I like it. I like it. Thanks for stopping by … good you checked out the FDA warning for the doggie food but good golly i wouldn’t feed my dog Bravo products !!! It’s obvious you have been framed!! Of course! I would never do that! I had no doubts! Although they did a good job making it coinside with you having a poorly stomch – that’s very dasterdly! Love it! 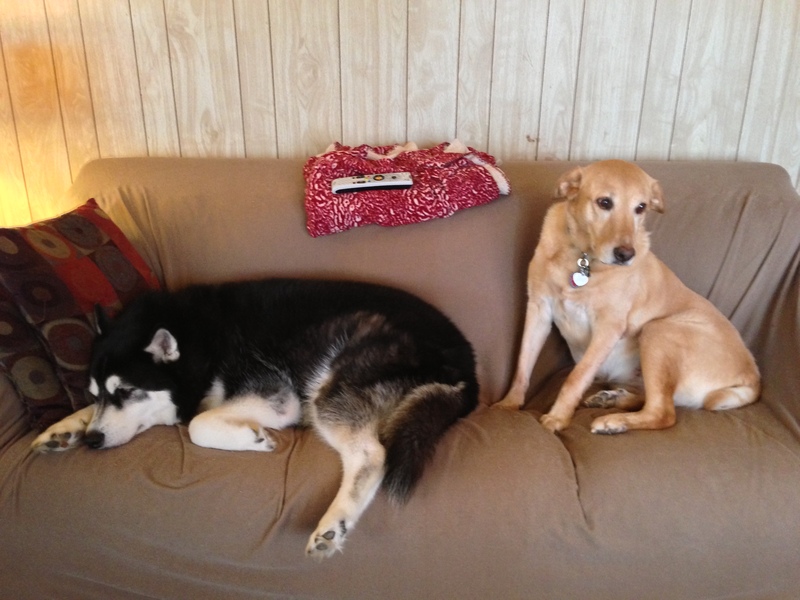 Thanks for stopping by the Woof Diaries!! Who is the cat? I say it looks like the cat had its friends over for a nice purrty. Typical after-purrty look in the kitchen… What I don’t understand is how they could have this party without you noticing them? Or did they bribe you with the fishy cat food? I’ve had that happen at least 5 times. My dogs love bins! When you get home and the whole lounge room is strewn with rubbish – it’s a lovely feeling!! !